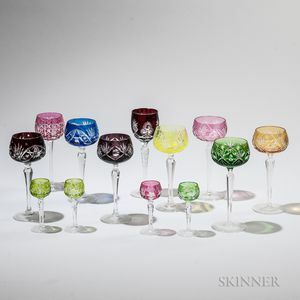 Twenty-nine Pieces of Colored Glass Stemware, probably Bohemia, early 20th century, each cut-to-clear in varying colors, including twenty-five wines, ht. 7 3/8 to 8 1/4, and four cordials, ht. 4 1/2 in.